Abamectin is a broad-spectrum antiparasitic active ingredient used in veterinary medicine in pets and livestock against external parasites (lice, mites, etc.) as well as against internal parasites (e.g. roundworms). It is also used against agricultural and household pests. It belongs to the chemical class of the macrocyclic lactones. Type of action: Systemic & contact broad-spectrum ectoparasiticide and endoparasiticide. Main veterinary parasites controlled: Gastrointestinal and pulmonary roundworms, lice, mites, horn flies; myiasis by screwworm flies, bot flies, warble flies, etc. Click here to view the article in this site with the most common dosing recommendations for abamectin used in domestic animals. WARNING: Dogs of some breeds do not tolerate macrocyclic lactones or other medicines (e.g. emodepside) that can cross the blood-brain barrier. They can suffer more or less serious adverse effects if treated at dose rates slightly higher than the recommended ones. Consequently dosing must be as accurate as possible. This is the case for Collies and related breeds, which have a mutation in the MDR-1 gene that affects the blood-brain barrier and makes it more permeable to such compounds than in dogs without this mutation. Besides Collies, other dog breeds have shown similar problems, although the MDR-1 mutation has not been confirmed in all of them. The breeds more affected by this mutation are (% frequency): Collie (70%), Long-haired Whippet (65%), Australian Shepherd (50%, also mini), McNab (30%), Silken Windhound (30%), English Shepherd (15%), Shetland Sheepdog (15%), English Shepherd (15%), German Shepherd (10%), Herding Breed Cross (10%). Other less affected breeds are: Old English Sheepdog, Border Collie, Berger Blanc Suisse, Bobtail, Wäller. The only way to be sure that a dog is affected or not is to test for it. As more dogs are tested it is likely that the mutation is discovered in other breeds, or that the frequencies change. Learn more about abamectin safety. Never use products on dogs and cats unless they are explicitly approved for both livestock and pets. Pets may not tolerate livestock formulations. On livestock: Yes, cross-resistance with ivermectin, very frequent in gastrointestinal roundworms of sheep, goats and cattle. There are a few reports on cattle ticks (Boophilus microplus) resistance to ivermectin. 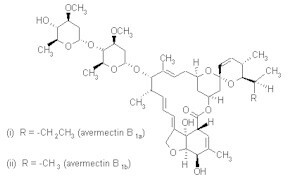 Abamectin is a natural mixture of avermectin B1a (~80%) and B1b (~20%), obtained directly from fermentation extracts of Streptomyces avermitilis. Efficacy and spectrum of activity are similar to other macrocyclic lactone. It is a broad-spectrum parasiticide with efficacy against the major parasitic roundworms: gastrointestinal (e.g. Haemonchus spp, Cooperia spp, Ostertagia spp, Trichostrongylus spp) and pulmonary (e.g. Dictyocaulus spp). It is also effective againts several ectoparasites such as lice, mites, myiasis caused by screwworm flies, bot flies, warble flies, myiasis (e.g. those caused by screwworm flies, bot flies and warble flies) and horn flies (only when applied as a pour-on). However, efficacy depends significantly on the delivery forms, the dose administered and the host. Cattle ticks (Boophilus spp) are sufficiently controlled only by pour-ons. Other ticks (e.g. Amblyomma spp, Hyalomma spp Dermacentor spp, Ixodes spp, Rhipicephalus spp) are not controlled at all by abamectin products. Abamectin does not control tapeworms or flukes, neither in livestock nor on pets. It does not control fleas or ticks on pets. After topical administration abamectin is poorly absorbed through the skin. After oral administration to sheep, peak plasma levels were observed 12 to 36 hours after treatment. Half-life plasma elimination was 50 to 90 hours. Excretion was almost completely through feces, <0.5% through urine. After subcutaneous injection to cattle half-life plasma elimination was ~5 days and excretion was mainly through feces, only 1-2% through urine. As all macricyclic lactones abamectin acts as agonist of the GABA (gamma-aminobutyric acid) neurotransmitter in nerve cells and also binds to glutamate-gated chloride channels in nerve and muscle cells of invertebrates. In both cases it blocks the transmission of neuronal signals of the parasites, which are either paralyzed and expelled out of the body, or they starve. It also affects the reproduction of some parasites by diminishing oviposition or inducing an abnormal oogenesis. In mammals the GABA receptors occur only in the central nervous system (CNS), i.e. in the brain and the spinal chord. But mammals have a so-called blood-brain barrier that prevents microscopic objects and large molecules to get into the brain. Consequently macrocyclic lactones are much less toxic to mammals than to the parasites that do not have such a barrier, which allows quite high safety margins for use on livestock and pets. A notable exception to this are those dogs that carry the MDR-1 mutation previously mentioned.